The wonderful thing about Cilicia is the pure number of fantastic sites that exist. So here is the second part of my preliminary research into sites in Cilicia in Anatolia. Evidence of occupation for Adana dates as far back as the Neolithic period and is considered to be the oldest city in the region. The city was of minor importance in the Roman Period but was used during the period of Pompey as a prison for the pirates of Cilicia. It also acted as a way station for troops of the Roman military heading eastwards. It split from the Roman Empire in 395 AD and received some development during the time of Julian the Apostate. Construction included large bridges, roads, government buildings and irrigation systems which allowed Adana to function more securely as an important trade centre. Campestris is located in the area of modern Mopsuestia, 20 km east of Antiochia ad Cragum. Its foundations are said to lie in the legend of the soothsayer Mopsus who lived there before the Trojan War. Pliny the Elder mentions the city as Mopsos in 5.22. It was named thus also by Stephanus of Byzantium and the Christian geographers. In the Seleucid Period it took the name Seleucia on the Pyramus and then in the Roman conquest it was named under Hadrian as Hadriana and under Decius as Decia. Its main history lies in the Byzantine Period when Constantius II built a magnificent bridge over the Pyramus which was later restored by Justinian as told by Procopius. Christianity was introduced to the city in the third century AD and its association with Christianity continued until it was taken over by the Arabs and became Islam. Forts were also constructed in this period. Efforts were made by the Byzantines to re-Christianise the city in the eleventh century. Anazarbus is also known as Ain Zarba, and is located in the present Cukurova. It is famous as the treasure city in the wars of Eumenes of Cardia as expressed by Suda but this claim is likely false in light of Strabo’s ideas. In the Roman period it was know as Caesarea and was part of Cilicia Secunda. It was rebuilt by Justin I in the 6th century and was thus renamed Justinopolis. Archaeological remains include a triumphal arch and colonnades of two streets, a gymnasium and a stadium and theatre. Acropolis fortifications also remain and the ruins of two churches, a gatehouse, and keep built by Thoros I in the twelve century. Aqueducts and a necropolis also remain. Nephelium/Nephelion is located in the area of modern day Muzkent about 38km WNW of Anemurium on the coast at the foot of Mount Cragus. Nephelium is mentioned by Ptolemy and in the Stadiasmus maris magni. It was at one point the seat of a bishopric atthe council of Calchedon in 451 AD. And finally to the most important site, well to me because this is where my dig is. Antiochia ad Cragum has also been called Antiochetta and Antiohia Parva which basically translate to ‘little Antiochia’. Its name ‘Cragum’ comes from its position on the Cragus mountain overlooking the coast. It is located in the area of modern Guney about 12km from the modern city of Gazipasa. The city was officially founded after by Antiochis IV around 170BC when he came to rule over Rough Cilicia. The site covers an area of around three hectares and contains the remains of baths, market places, colonnaded streets with a gateway, an early Christian basilica, monumental tombs, a temple and several structures which are yet to be identified. Excavations are currently being undertaken by the Antiochia ad Cragum Archaeological Research Project headed by the University of Nebraska-Lincoln. The site and its harbour likely served as one of the many havens for Cilician pirates along the South Anatolian coast, likely because of its small coves and hidden inlets. Unfortunately no definite pirate remains are visible in the modern day. Its pirate past ended with Pompey’s victory in the first century BC and the take over by Antiochis IV. Initial occupation appears to have occurred in the Classical and Hellenistic periods followed by a surge of activity in these Roman periods. The city itself was built on the sloping ground that comes down from the Taurus mountain range which terminates at the shore creating steep cliffs; in some places several hundred metres high. The temple complex is situated on the highest point of the city and most of the building material remains though in a collapsed state. There is also evidence of a gymnasium complex nearby. The harbour at Antiochia ad Cragum measures about 250,000m squared and is one of the few large, safe harbours along the coast between Alanya and Selinus. On its Eastern side are two small coves suitable for one or two ships but with limited opportunity for shipping and fishing due to wave activities. The area is well situated as a defensible position against invaders. Recent Terrestrial survey at Antiochia ad Cragum has had emphasis on finding evidence of pirate activity which has been limited, but it has turned up pottery principally from the Byzantine period with additional pottery from the late Bronze Age, the Hellenistic and some from the Roman periods. There is little evidence of pre-Roman occupation at the fortress or pirate’s cove at Antiochia ad Cragum. Banana terracing may have caused much of the evidence to have been erased. The maritime survey has turned up shipping jars, transport Amphoraes and anchors from the Byzantine, Roman and Hellenistic periods as well as a range of miscellaneous items. The assemblage appears to indicate early activity to the West of the harbour moving East over time. Hamaxia is located in Western Cilicia in the area of modern Sinekkale about 6km from Coracesium. There is little literature about the site but the archaeology includes well-preserved evidence of a walled-in settlement with an arched gate on its South side and a three-naved church in its West. There is also a necropolis in the North-West. Hamaxia is mentioned in Strabo 668 and in Stadiasmus 208. Inscriptions indicate that Hamaxia only achieved a city status in the early third century BC. Even the few pieces of literature we do have mentioning Hamaxia appear confused. Strabo says that the city lies to the East of Coracesium while Stadiasmus says it lies to the West. The Lamos is a river which formed the boundaries between Cilicia Campestris and Cilicia Trachea and later between Cilicia Aspera and Propria. Antiochia Lamotis is the city closesly associated with the Lamos at its mouth. Antiochis Lamotis was itself originally called Lamos and is formerly the capital of the surrounding region known as the Lamotis during the Roman period. 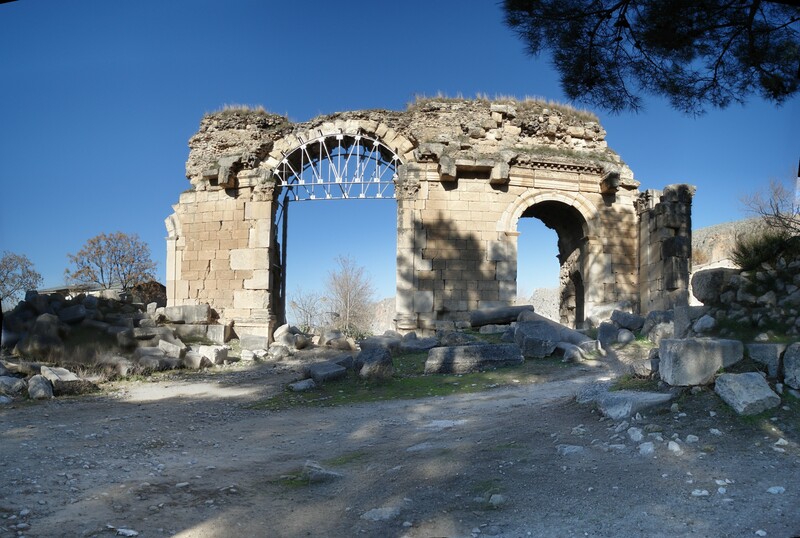 The city Lamos/Antiochis Lamotis is located a few km southwest of Modern Erdemli. It was founded in the Hellenistic period. Korykos/Corcus is located at the mouth of the river Şeytan deresi in the area of Modern Kızkalesi. Korykos is mentioned in the ancient literature by Pliny, Livy, Pomponius Mela and Stephanus of Byzantium, but curiously not Strabo who provides comments on most of the other major cities in Cilicia. The city was an important habour and commerce area and was a port of the Seleucids before the Romans took over when it became a lookout for Romans to look out for pirates. Korykos was later controlled by the Byzantine Empire when Justinian I constructed the public baths and hospital. Alexios I Komnenos constructed the later fortress and in the 12th century a castle was built nearby on a small island known as ‘Maiden’s Castle’. The archaeology of Korykos is vast and includes a triumphal arch and necropolis with Christian tombs and sarcophagi. 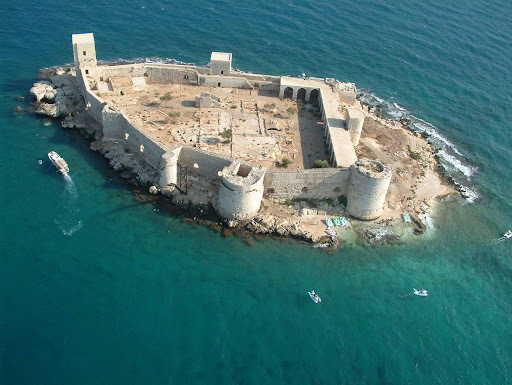 In addition to the Roman archaeology there are two medieval castles in Korykos, one on the shore and the ‘Maiden’s Castle’ which is connected to the shore by the ruins of a pier. The mainland castle walls contain many pieces of columns from previous buildings. Three churches have also been excavated, one of which still had the remains of frescos. The city walls can also still be traced. Strabo may not mention the city of Korykos but he does mention a Corycian cave in which he says grows the best Saffron (Crocus). The Coryian Cave was a circular hollow filled with shrubs and containing a spring. It is famed in Greek mythology as the cave of Pindar and Aeschylus as the lair of Zeus’ opponent, the giant Typhon. 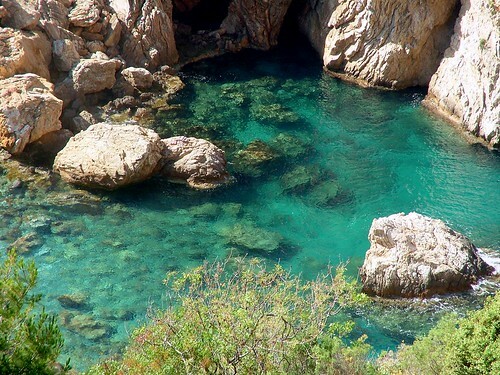 Coracesium was located in the area of Alanya about 160km from modern Antalya. Archaeology indicates that there was occupation in the area as far back as the Paleolithic period with subsequent evidence for the bronze age. There is evidence for Phoenician interaction dating to around 625BC with the existence of Phaenician language tablets and the city is found in the Greek record in a fourth century BC geography manuscript known as the periplus of Pseudo-Scylax. The rock where the castle is now situated was probably first inhabited by the Hittites and then under the Achaemenid Empire. It was only first fortified though in the Hellenistic period following the conquest of Alexander the Great. Coracesium later came under the control of the Ptolemies and later a popular port of refuge for the notorious Cilician pirates. Like much of the surrounding area, the piracy in Coracesium ended with the victory of Pompey in the first century BC, with the battle of Korakesion fought in the city’s harbour. Coracesium later moved into the control of the Byzantine Empire and then Islam arrived in the seventh century with the Arab raids. This also led to additional fortifications being built. Numerous bishoprics and battles were undertaken throughout the medieval period onwards. The medieval period also saw the construction of the impressive Alanya castle and the Ottomans also brought with them an array of architecture. This entry was posted in Archaeology, Musings and tagged Alanya, Anatolia, Anemurium, Antiochia, Antiochia Lamotis, Bronze Age, Byzantine Empire, Cilicia, constantius ii, Cragum, Hamaxia, irrigation systems, Lamo, Lamotis, magnificent bridge, Mopsuestia, mopsus, Mount Cragus, Neolithic, Nephelium, Pomponius Mela, Roman, roman conquest, Roman Empire, Strabo, travel. I hope you won’t get disappointed by the amount of development that has affected half these amazing sites eg taxi ranks right by ancient walls etc etc. And what about the political situation down there righ now? ie Syria? I am sure your organization is monitoring it all very carefully :). Yeh, they are pretty good on OHS.